An editor friend invited me into an anthology, up to date stories about the solar system. I chose Pluto, as I often have; but of course we know more now. This story might not work for that book, given it’s way in the future. I need to study Pluto more. I’ve done many Pluto stories. I set Pluto afire in WORLD OF PTAVVS, and that still looks possible: pockets of methane or ammonia, pockets of oxygen, just waiting for a rocket’s landing flame. News is flooding in from “New Horizons”. I expect that will continue. I love the picture of water ice islands afloat in liquid nitrogen seas. STARBORN AND GODSONS by me, Jerry Pournelle, and Steven Barnes. Jerry died before we could finish, but we turned in a draft yesterday. Jerry’s last book. It’ll be our final draft unless Eleanor Wood or an editor has suggestions. GLORY AND HONOR (needs a new title) with Gregory Benford, a sequel to THE BOWL OF HEAVEN and SHIPSTAR. Greg’s name comes first: find it that way. I expect to be writing short stories for a while, with collaborators. “By the Red Giant’s Light” appears in the November/December 2017 issue of F&SF. 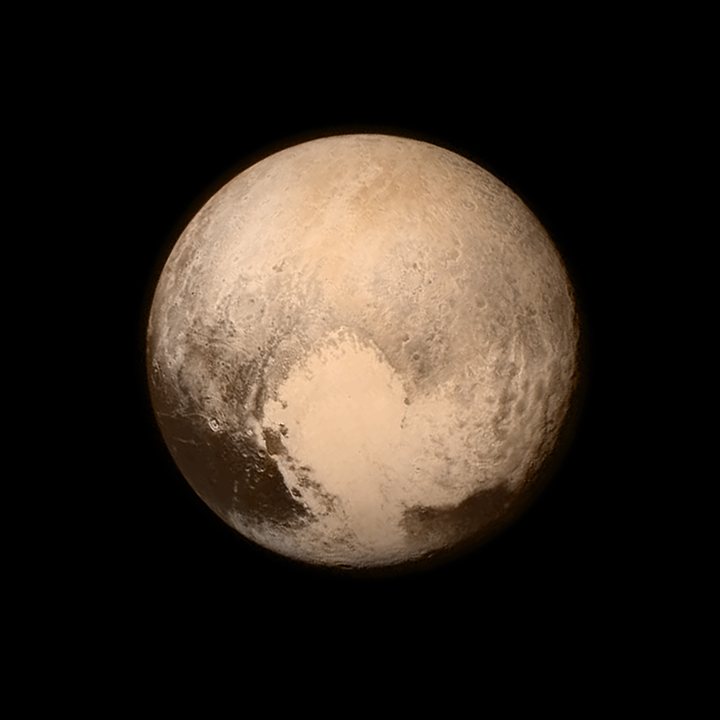 Click on the image of Pluto and you will be taken to Mr. Niven’s website. Many readers have probably figured out that the story is about life in our current economic situation, where the rich hoard more wealth than they could possibly need while the rest of us have to survive on less and less. And yet somehow many of us still worship these people as benevolent rulers, captains of industry, “job creators,” and so on. Ur-Ena is the sort of person who finds financial success in our strange late capitalist hellscape. He’s empty inside of everything except the desire to serve his lord, driven by forces he does not understand, ever consumed by a hunger that is not his own—he’s the ultimate company man. He’s not particularly bright or interesting, but he’s pretty well-off financially, so people respect him. The boy, Dumu-Inana, is a stand-in for the Millennial generation. He’s a whiny little jerk sometimes, sure, but he knows something’s wrong and he refuses to pretend that everything is okay. I thought up the story while suffering through a long, painful job hunt and reading lots of career self-help articles. “Water God’s Dog” is heavily influenced by the language and culture of Ancient Sumer. The specialized vocabulary and the names are all drawn from Sumerian. The protagonist’s name/title, Ur-Ena, means “dog/faithful servant of the Water Lord.” (“Ur” was a common component of personal names, and people were often named after some patron deity.) The boy, Dumu-Inana (“child of Inanna”) is named after a goddess who tried to conquer the Underworld. The name of the water god, Ganba, is the Sumerian word for marketplace. I also modeled the prose after Sumerian, which did not have a definite article and didn’t use many conjunctions. And the narrative draws heavily from the myth of Inanna’s Descent. Unlike Judeo-Christians, who believe in a just universe governed by a benevolent god, or even the Egyptians, who at least saw the universe as an orderly place, the Sumerians seemed to view the world as a realm of chaos and decay. The Tigris and Euphrates rivers they depended on were constantly shifting, drying up canals and leaving farmland desolate. Their city walls constantly crumbled and always needed repair. In light of recent events, I find their mindset very relatable. I’ve spent a long time studying Sumerian—not just the history, but the language, too. A major component of my senior project for my undergraduate degree was to translate Inanna’s Descent from Sumerian into English. (I relied on transliterations, though—not the original cuneiform.) In addition, I’ve written a few short articles about the role of queer sexuality in Sumerian religion. Was “Water God’s Dog” personal to you in any way? If so, how? “Water God’s Dog” captured a lot of my frustrations trying to find a decent job and make a living in the Great Recession. In the story, I’m the empty waterskin woman wailing at the altar, wondering why Ganba has so little interest in her offering. I think a lot of writers and artists are in this position, holding out their incredible talents to the free market and getting very little in return. Despite the overall somber tone of the story, I’d like for readers to come away with a sense of cautious hope. Things can change, if we keep struggling, though the journey will be painful. I’m still working on the first draft of a gothic novel. I’m also writing an online serial sci-fi adventure novel about virtual reality and the military industrial complex. It’s called Hive, and it’s available on my website. https://rs-benedict.com/portfolio/hive/ In addition, I have a short story in Upper Rubber Boot’s upcoming anthology Broad Knowledge: 35 Women Up To No Good. “Water God’s Dog” appears in the November/December 2017 issue of F&SF. Here’s a picture of the opening ceremonies of the 1966 Worldcon from the Eaton F&SF Archive at UC Riverside, taken by Jay Kay Klein. 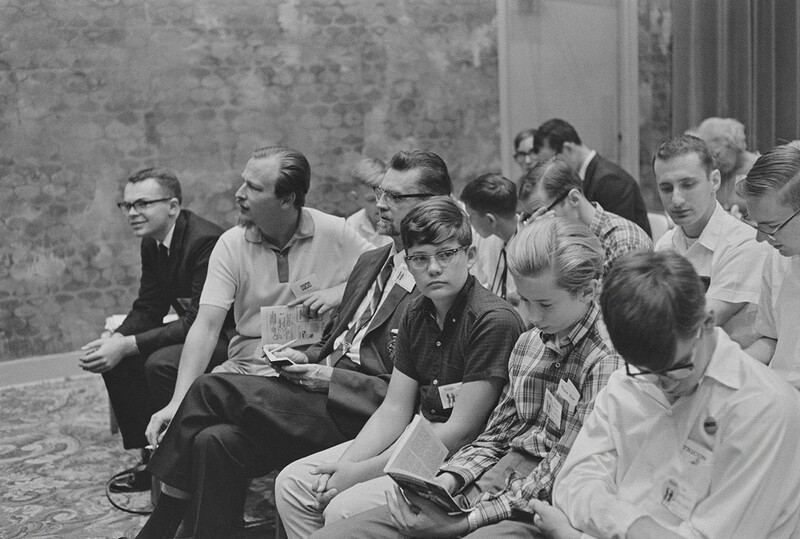 The young man in front is reading the April 1966 issue of F&SF instead of paying attention to the event. We wonder if anyone recognize the authors sitting in the front row with him? Or if you want to take a guess at which story he’s reading? “Stillborne” is, from what I can tell, the last Gorlen Vizenfirthe story. Or maybe it’s merely the last short story in the sequence I’ve been telling for the last couple decades. It’s possible I might write some interstitial stories from when Gorlen was on his own, since there are a few old ideas I never quite nailed down, but the forward progress of the series feels like it hit a natural stopping place. I recall only that I was trying to come up with a new Gorlen story on a hike at Rattlesnake Ledge near Seattle, and by the end of the hike I had the basic idea (which I won’t mention for the sake of spoilers), and a few lines of dialog, and they thrilled me. They took the series to a place I had never thought of before. Even so, it was years before I managed to get a first draft I was happy with. The basic notion never changed, the idea of a reunion with a character never seen before except in Gorlen and Spar’s reminiscences, but everything else came later—the stills, the desert festival. I tried a lot of different settings and plots before finding one that set off, or fed into, the characters’ current internal situation. Was “Stillborne” personal to you in any way? If so, how? It deals with some issues that are personal to me, which the heroes of most of the wandering rogue fantasy tales never deal with. Gorlen in many ways fits the model of a typical kind of fantasy character—a lone traveler, falling in and out of discrete dilemmas. The early stories were very much inspired by Cugel the Clever, where each story was a self-contained episode, and the overall arc was negligible. When I was a kid, this was fine. But I’ve been revisiting Gorlen at different times in my life, and my concerns have changed over time, and I’ve tried to reflect those in the character. So, again, without spoiling anything, the main personal issue here is one most male fantasy heroes of the itinerant variety don’t ever deal with, but it’s been an important part of my life, so I thought it would give Gorlen’s journey a bit more meaning. Your stories of Gorlen the Bard debuted in F&SF twenty-two years ago: what can you tell us about how that first story came to be, and what led you to bring Gorlen’s tale to a conclusion now? I created Gorlen in high school, very much under the spell of Jack Vance, and wrote a novel about him called MISTRESS OF SHADOWS, which I revised into my early Twenties. Sometime in my late Twenties, I destroyed the manuscript, I think because it felt too derivative, or I was tired of reworking it, or something. At that time I didn’t see myself as being a writer of genre fantasy. But the character hung around, and as my life went on, I wondered what would have become of Gorlen after his original adventures. I liked the idea of writing about a fantasy character whose big world-saving epic adventure was in his past, and now he was just left wandering, trying to pick up the pieces. I had no desire to ever go back and recreate that novel again, but when the idea for “Stillborne” came along, I felt that it was the perfect time to finally bring in his so-called origin story. And once I had done that, it felt like I had come full circle, or reached a state of completion. Gorlen’s life continues after this, and maybe someday I will get back to him, but I also didn’t feel like stringing readers along forever with no hope of resolution…so the way the characters feel about things at the end of “Stillborne” is about how I feel. Where they end up is good enough for me. I just finished a very silly project which has had various titles, the current one being MARY SHELLEY’S FRANKENSTEIN, NOW WITH EXTRA MONSTERS. I started it when my kids were in high school and each had to read Frankenstein, and each was disappointed by how dull it was, and specifically how they had expected lots of horror and monsters in it. It starts with endless correspondence and journal entries and takes a long time to get to the monster. So I hatched the idea of taking Shelley’s tale and adding monsters to it, not quite at random. I have tried to make sure there is a monster or monster reference in every paragraph of the original work. Having done that, I am now seriously questioning my own sanity and sense of proportion. I have no idea what to do with it yet. “Stillborne” appears in the November/December 2017 issue of F&SF. 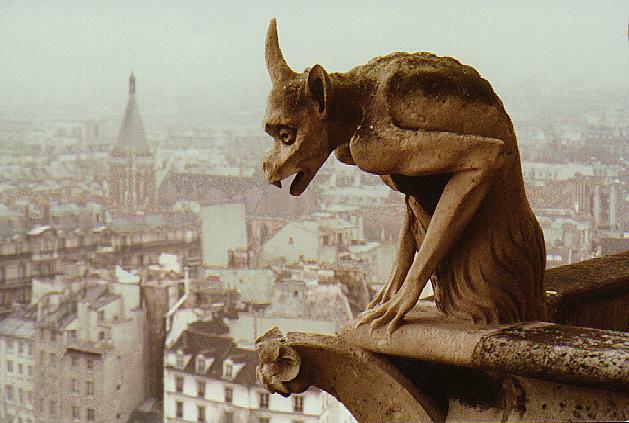 Click on the image of the gargoyle and visit Mr. Laidlaw’s website.